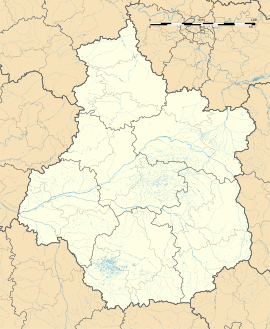 Montargis (French pronunciation: ​[mɔ̃taʁʒi]) is a commune in the Loiret department in north-central France on the Loing river. The town is located about 110 km (68 mi) south of Paris and 70 km (43 mi) east of Orléans in the Gâtinais. Though the town is known to date to ancient times, during the Renaissance fanciful etymologies were invented to account for the place name Montargis, whether as mons argi, Mount of Argus, the place where the jealous goddess Juno charged Argus Panoptes with guarding her rival Io, or connected with the chieftain Moritas mentioned by Julius Caesar, in his Gallic Wars. Numerous Gallo-Roman artifacts have been found in the area, and many are in the town's Gâtinais Museum. Later, the town was a stronghold of the Frankish king Clovis I.
Montargis was originally a seat of the house of Courtenay, who fortified a château on a hill overlooking the town. The town was ceded to the king of France in 1188. In the 14th and 15th centuries, it was a royal residence. In 1427, during the Hundred Years' War, the Earl of Warwick besieged the town with artillery, beginning bombardment on July 15. During the siege, the residents of Montargis sabotaged the dikes of numerous ponds in the district, flooding and drowning many of the besieging Plantagenets. On September 5, a French force of 1600 men broke the siege, led by Jean de Dunois and La Hire, commanders who would go on to lead the army of Joan of Arc. This marked the first important victory by the army of King Charles VII in the war, gratefully remembered by Charles later. After being wounded in an unsuccessful attempt to besiege Paris in September 1429, Joan of Arc passed through Montargis on her way to Gien. After the war, Charles VII, rewarded the town for its valor in the war by granting it various privileges. In 1490, his later successor Charles VIII officially declared the town Montargis Le Franc ("Montargis the tax-free"). This title is abbreviated as "MLF" in the official coat of arms (seen in the seal shown here). This privilege was renewed by his successors, and Montargis remained free of taxes for three centuries, until it was revoked during the French Revolution. In 1528, King Francis I granted the town to his sister-in-law, Renée of France, Duchess of Ferrara and daughter of King Louis XII. After her husband Ercole II, the Duke of Ferrara died in 1559, Renée resided at Montargis. She sheltered there Protestant Huguenots fleeing from persecutions in Paris and elsewhere during the 16th century French Wars of Religion. The best-known legend of Montargis is that of the "Dog of Montargis." In the story, Aubry de Montdidier, a courtier of King Charles V of France, was murdered around 1400 in a forest near Montargis by Robert Macaire, an envious knight. After his death, Mondidier's dog showed a remarkable hostility to Macaire. King Charles decreed a trial by combat in the town between the dog and Macaire, who was armed with only a cudgel. After the dog won the battle, Macaire confessed to the crime and was hanged. A dramatic bronze statue of this fight is in the courtyard of the Girodet Museum in central Montargis, and the contest is depicted in a stained glass window in a local church as well. The story was the subject of a 19th-century melodrama, Le Chien de Montargis, ou la Forêt de Bondy, that held the stage for years in Paris and was performed in English and German translations. In the 1880s, a rubber factory was built in Châlette, a district of Montargis. It today employs 2000 workers to produce tires and parts for vehicles and appliances. Pralines, the crunchy confection made from almonds in cooked sugar, were first confected in Montargis in the time of Louis XIII. The original shop is still in business on Place Mirabeau. Louis-Jacques Bresnier (1814–1869), 19th-century orientalist was born in Montargis. ^ Meade, Jennie C. "Most Unusual Duel". The Duel. George Washington University Law School. Archived from the original on 23 April 2008. Retrieved 8 August 2008. ^ "Montargis". CosmoVisions (in French). Retrieved 13 February 2017. ^ "Le chien de Montargis sur un vitrail". Centre de Recherche sur la Canne et le Bâton (in French). Retrieved 13 February 2017. ^ "Vivre a Montargis". Retrieved 13 February 2017. Wikimedia Commons has media related to Montargis. "Montargis" . Collier's New Encyclopedia. 1921. "Montargis" . Encyclopædia Britannica (11th ed.). 1911.